A few hundred couples from around the country are expected in the northeast Iowa town of Nashua this weekend for a wedding reunion at a historic church. 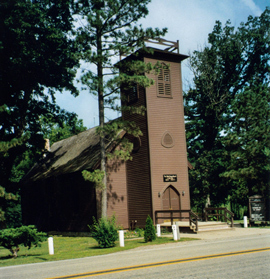 The Little Brown Church in the Vale, which opened in 1864, has hosted nearly 73,000 weddings. Pastor Jim Mann says the 57th annual Wedding Reunion at the church will begin on Saturday, but will be highlighted by the Sunday morning service. He says old hymns will be sung at 10:15 Sunday morning, followed by a worship service that will include a renewal of wedding vows. At 11:30 a.m., a picnic lunch will be provided along with various entertainments. “During that time, we’ll be awarding prizes for those that have been married the longest…whoever’s come from the farthest or some other prizes,” Mann said. The Little Brown Church still hosts nearly 250 weddings and thousands of tourists every year. Mann says one couple stopped by last Friday and timed their visit for precisely 3 p.m. because they held their wedding at the church at that time exactly 50 years ago. More information about the church and the wedding reunion is available at here .